What is the biggest air pollution event in the modern era? It’s hard to think of the scale of the biggest air pollution event in the modern era. Immediately my mind conjures up memories of black and white photographs of the Great London Smog of 1952. 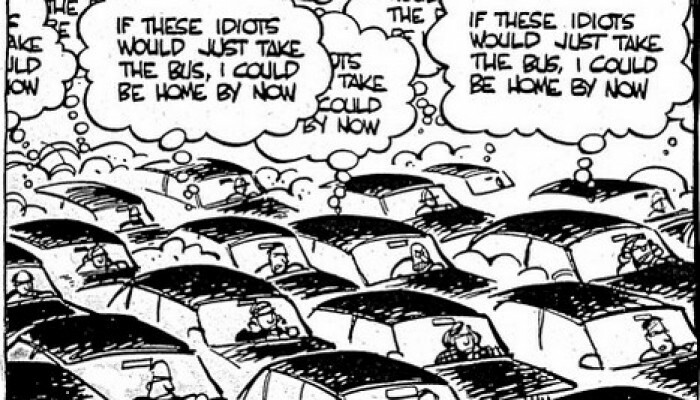 Then I start thinking bigger, how about the 1.2 billion vehicles world-wide on the road churning out nitrogen dioxide every single day? Well these are a drop in the ocean compared with bigger industrial polluters. A recent study by the World Health Organisation pegged the financial damage to Europe by anthropogenic air pollution in 2010 at a whopping €2 Trillion. However all of these anthropogenic pollution events pale in comparison compared with mother Earth. A single volcano, Mt. Etna in Sicily has been known to emit the same amount of sulphur in a year as all of French industry. So, perhaps we just need to find the biggest volcanic eruption in the modern era? This is the 1815 Tambora eruption, the biggest in the last 10,000 years. Actually, no – how explosive a volcanic eruption is and the amount of potentially harmful sulphur dioxide it emits are not always related and even then the dangers these pose to humans depend on weather conditions. 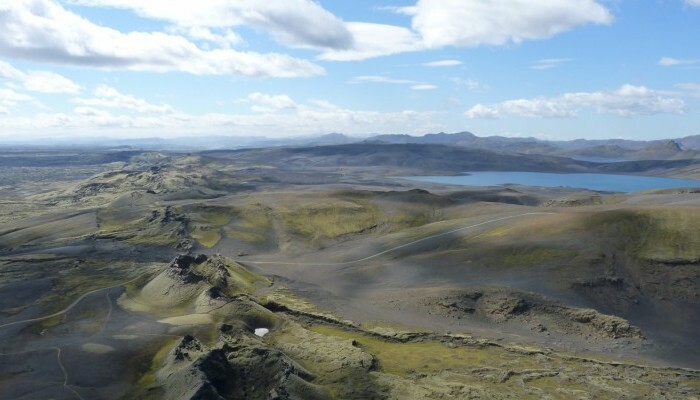 In the modern era there is one natural contender: pumping out 15 times more sulphur as the whole European region in 2010, the 1783 volcanic eruption of Laki. The eruption carried gases into the atmosphere to the start of the tropopause. This is not abnormal, the 2010 eruptions of Eyjafjallajökull followed the same path. What was different from other eruptions was the amount of gas. The Laki eruption carried an estimated 8 million tons of poisonous hydrofluoric acid and 120 million tons of sulphur dioxide into the atmosphere. Here the gases entered the jet stream; a narrow band of intense winds found at about 16 km altitude and this had far-reaching effects. 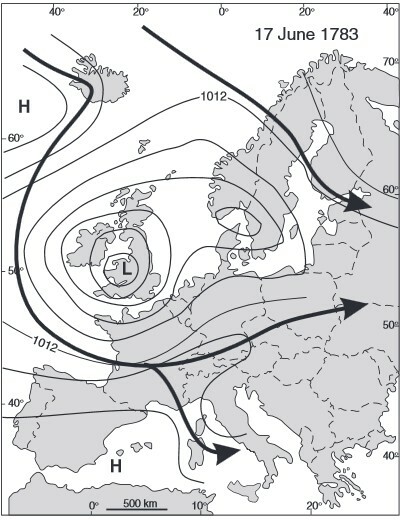 A high pressure area over Iceland at the time of the eruption caused the poison ridden winds to move south-east and subside over Europe. This resulted in many thousands of deaths because sulphur dioxide gas reacts with moisture in lungs to form sulphurous acid. High pressure blocking over Iceland (top-left) during Laki eruption caused eruption clouds to move over Europe. Image adapted from: Thordarsson and Self (2003). The ‘Laki haze’ did not dissipate due to hot weather until the autumn and acted like a heat blanket creating convection from increased surface heating resulting in thunderstorms. This directly led to severe flood damage in central Europe. Crop and livestock damage followed. A famine began in Iceland where most of the livestock died from skeletal fluorosis; a condition caused by ingesting fluoride which leads to decreased bone strength, increased risk of fractures and impaired mobility. This one event weakened the African monsoon circulation leading to less precipitation over the Sahel and resulting in an Egyptian famine due to a shortage of water in the Nile. The Chalisa famine in India occurred also the same year and resulted in 11 million deaths on the subcontinent. However the second of these famines can also be linked to changing El-Niño conditions over the preceding years. The volcanic eruption gases on the atmosphere were as far reaching as North America where there was reported to be ice in the Gulf of Mexico. A cycle of unusual seasons continued for several years after and caused huge global economic hardship which has been thought to be one of the drivers behind the French Revolution. The large amounts of Sulphur dioxide that remained in the atmosphere may have caused global average temperatures to fall by 1°C for the next couple of years. About 6 million people died as a result of the eruption, either directly or indirectly – this was about 1% of the world’s population at the time. The Laki 1783 eruption is troubling. In the popular imagination big explosive volcanic events are the most devastating and cone shaped volcanos like Krakatoa are more embedded in our consciousness. However a lesser-known less explosive volcano, if well placed in terms of weather patterns, could potentially be more devastating. If an event like the Laki eruption were to happen again we could expect cold weather and maybe a year without summer. Modern volcanic monitoring practises could help us prepare for such an event but its global nature would still be very disrupting to our lives.